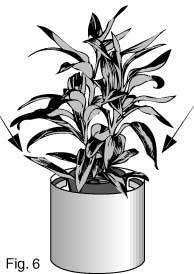 Drop one or several pot steps inside decorative container to achieve desired height as shown in Fig 1. Cut big brown collar with scissors into three pieces as shown in Fig 2. With clean cloth wipe inside of decorative planter to remove dirt or other particles from surface. Pick up one piece of collar with foam facing palm. With thumb pull foam back while with the other hand simultaneously pulling the release paper off. Stick pieces on inside of planter leaving at least 2-2.5 inches between pieces. This will allow inspection of the bottom of planter during the life of the plant. See Fig 5. Drop the plant into the decorative pot. See Fig 6.